Nothing but meat and bread. With a long layover in Houston, Texas, I needed something to eat. Although eating at a chain would have been a safe bet, I like to live on the edge. I also wanted to make sure I got something unique to Texas. When I found Caritas Ranch Bar-B-Q, I knew I had to have it. The place didn’t offer much in terms of options for the main course or for sides, but it was an airport so I let it slide. The best-looking thing on the menu to me was the sliced beef sandwich, so I ordered one. 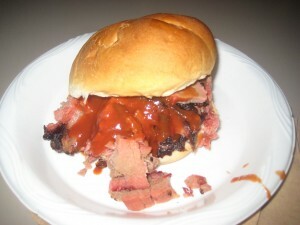 I then watched as they sliced the beef right in front of me, threw it on a bun and drizzled BBQ sauce over it. I had to admit, it looked pretty good, despite being cooked in an airport.